During the school year, I refer to going home as “second shift,” because the multitudinous tasks required as a parent are a job unto itself. I also often think of most situations from both “the teacher perspective” and the “parent viewpoint” since I switch between those hats so often. 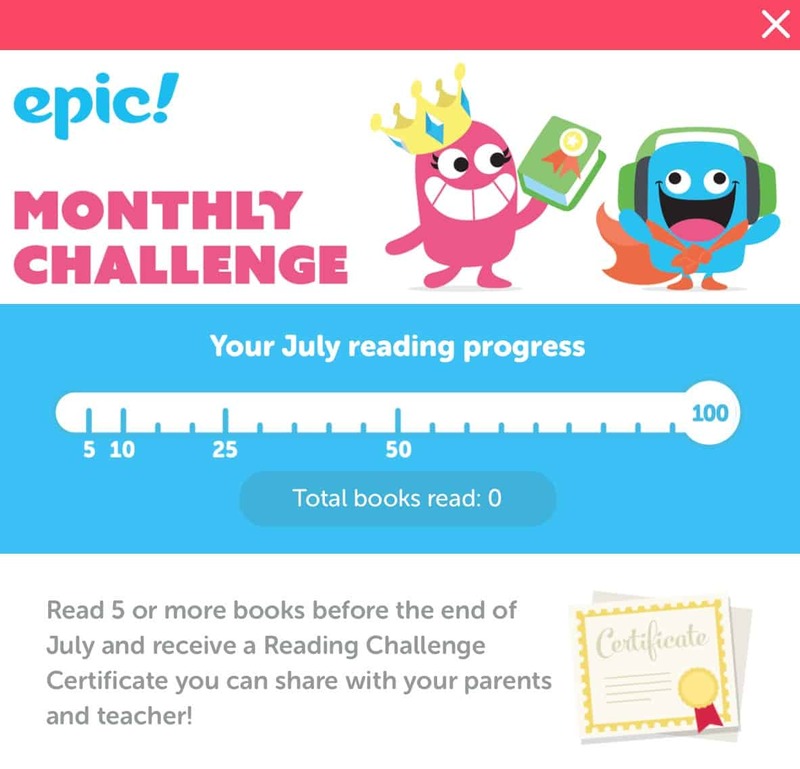 So as I was checking out Epic!, a digital library for ages 12 and under that provides unlimited downloads of its 25,000+ ebooks, videos, quizzes and audiobooks, I couldn’t help but think that a review from both angles might be helpful. 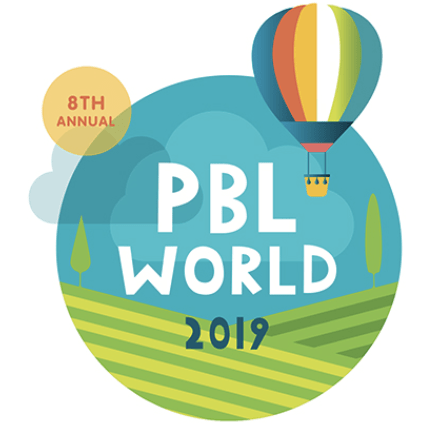 From a continuously tailored recommended reading list based on your child’s reading interest and levels, to compatibility with Google Classroom for uploading students’ profiles and tracking their progress, Epic! offers unique and innovative features both parents and teachers will enjoy. Since it’s summer, and parenting is now the first-shift job of the season, I’ll share my thoughts through that lens first. A Parent’s Perspective on Epic! Epic! was designed by parents concerned that their children spent more time playing games and watching videos than reading on their devices. They were also concerned that, while these games and videos were very easy to access, getting books usually requires a parent to purchase and download it every time their child wanted a new one, one book at a time. My kiddos are 9 and 12, and although I didn’t mind (too much) reading the same book fifty times over to them when they were younger, I’ll be honest and say I’ve really loved that my children’s hobbies and interests have branched out and led them to a variety of interesting books. Having an app where they could both access more than one book at a time that interested them is a wonderful thing, and I wish we’d had this option available when they were younger. Homeschooling parents could easily use this book as a part of their curriculum materials. The pictures were breathtaking, the writing was engaging and the vocabulary was a shade challenging for the proposed age range (which as a parent AND teacher I love). While a bit too young for her now, Zoey would have loved the historical aspect of this book a few years ago, and I’d have enjoyed the not-so-subtle feminist bent. Since she is right on the older edge of the recommended age range, I really hoped there would also be books she would like now. I was not disappointed and found A Month of Mondays, which began with an appropriate mix of adolescent angst and revelatory writing for my now-almost-teen. I’m confident that Epic! is still a great choice for Zoey–it would have been when she was a little girl and is now as well. Oliver, my 9-year-old son, on the other hand, is a bit more of a picky reader. However, he has a growing love of coding, a hobby that can only be attributed to YouTube tutorials (you can see one of our co-reviews here). So the nearly page long list of coding books caught my eye for him. Awesome Algorithms and Creative Coding is right up his alley, and the high-quality graphics and innovative layout are exactly what keeps him reading. From the parent perspective, Epic! is a solid “A.” Initially my main concerns about the site and app were if the resources offered would be interesting to my kids (they are), if it is easy for them to navigate (it is) and if it would make sense to purchase at $7.99 after the first free month (having children who can finish reading a single $7.99 book on the way home from the bookstore, I can say that this is a bargain). A Teacher’s Take on Epic! Having gone almost completely paperless in the classroom, I’ve wondered about making the leap to digital books instead of purchasing new novels (which inevitably get mislaid, forgotten at home, left on the bus and end up looking pretty worse for the wear after a single year). I can only imagine that this portability problem occurs even more in elementary school. Epic! has many features which completely rock from the classroom perspective. First of all, it is FREE to elementary teachers and librarians. Free, as all thrifty educators know, is awesome. Additionally, it is very user-friendly, allowing teachers to use their Google Classroom accounts to upload students. The directions are fabulously easy and were found within the “get help” portion of the website. The website also allows teachers (and parents) to send children mail, which is how students are given assignments. Always important from the classroom perspective as well is progress monitoring, which Epic! does really well. It gives the Accelerated Reader (AR) level and Lexile levels to ease the teacher’s selection process. I also love the “Monthly Challenge” section, which acts as both monitor and motivator. From both the parent and the educator perspective, Epic! is a win/win. Students will love the quality of the materials, variety and easy to navigate platform. Parents will love the way their children want to read and the ease of finding books that meet their needs, and they will find the monthly fee a ridiculously good bargain. Educators can use the site/app to differentiate for readers of all interests and abilities, and I would definitely use it to help parents understand the reading levels of their children. Whether for classroom or home use, or ideally the combination of both, Epic! is an excellent place for students, teachers and families to explore and grow a love of reading together. A special login code was provided to the author for this review. If you are interested in having GettingSmart.com review your innovative product or book, please contact Editor@GettingSmart.com. I have been using the app with my son at home for several months now and absolutely love it! It is worth every penny of the subscription fee as he gobbles up books and end enjoys the challenge features embedded in the app. I love that I can download books and take the tablet offline for traveling. I have a question about teachers assigning books. 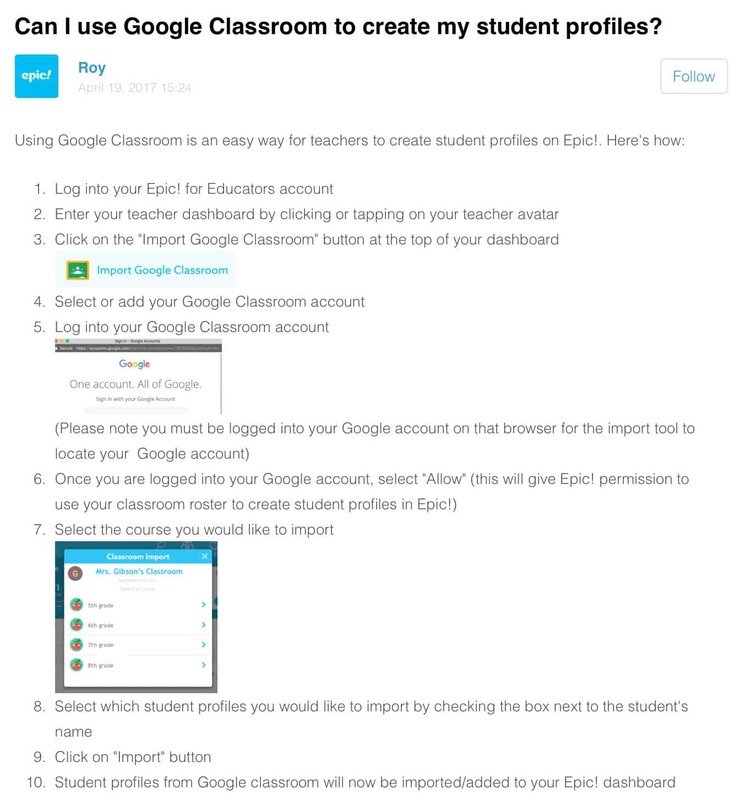 If he has a teacher who uses Epic, would he get a separate account for that? Just curious how that would work. Also, with a school account, do kids get to read at home? Can they choose books of their own? Would both of these be up to the teacher and how they set up the accounts? Thanks!